Let us now consider a very practical element of converting you from a poor kid to a rich kid. This has to do with . . . negotiations. Just about every time money changes hands in a major way, it is preceded by a discussion of what the price will be. Generally speaking, the asking price is high and the first offer is low. What happens after that, who knows. As you will soon see, poor kids are generally hobbled when it comes to negotiations, and inevitably get a lousy deal. Hopefully, we can now get you to think and negotiate more like a rich kid. To start us off, if you can stand the thought of going back one more time to that screaming kid in the convenience store checkout line wanting a candy bar and not getting it, well, bear in mind that the screaming you heard was the sound of someone who was not having a very good negotiation experience. And when that poor kid grew up, especially if that poor kid was you, right from the get-go your confidence was not very high, given your previous track record in getting what you wanted by negotiating. The pain of that past refusal experience lurks in the subconscious, and the mere thought of revisiting that psychic pain is enough to make anyone run for the exit. You would rather not do any negotiating at all ever again, thank you very much. But now, as an adult, to get what you want, you have to sit down across the table from some stranger and again face this dark nightmare. You are about to ask for a candy bar again, in the form of asking someone else to pay you money or do something for you. Your past experience in such matters has conditioned you to assume that it will not go well at all. This presumption of universal negativity [explained in previous chapters– ed.] is a tremendous disadvantage in the realm of negotiations. So, let’s calmly and carefully examine the whole process and see if we can’t make some improvements. The first disadvantage is the simple lack of knowledge and experience. There are many standard “negotiation techniques,” and since most poor kids don’t have much to trade in the first place, they never have occasion to learn them. The second disadvantage for poor kids is that they have been taught to put more trust in outside authority than in themselves, making them vulnerable to manipulative people. But perhaps the biggest problem for poor kids in negotiations is just the gut feeling of dread when negotiations occur, as there is an automatic expectation of a bad result. Poverty thinking always assumes the world is a negative adversarial place, where everyone fights with everyone else over scarce resources. In a world of limited resources, it also assumes that there must be a winner and a loser of every negotiation. Poverty thinking also preaches that you have to be just as nasty and negative in response to this negative world in order to effectively deal with it. If you don’t wish to be evil and negative, so the theory goes, then your only choice is to submit and surrender. This is poverty thinking, and like all poverty thinking, it is simply not true. A negotiation does not have to be a negative experience for anyone. Sometimes a negotiation is just a calm discussion and clarification between well meaning people of just who wants what. The poor kid presumption that one must be shrewd or tough in negotiations only applies to some negotiations, not all. It is far better to be calm than tough, and it’s far better to simply be clear on what you want and how much you want it, than to be some sort of sadistic manipulative game player. To always see negotiations as negative adversarial situations is a symptom of poverty thinking. So to begin rethinking your poor kid negotiating skills, let’s consider the basic elements of a standard, relatively unemotional, healthy, non-poverty-thinking negotiation. Just to give you an example, let’s say Jack and Jill are negotiating a fee for Jack, for mowing Jill’s lawn. Jack says, “I’ll do it for $100.” Jill refuses this offer. She says, “No, you can’t have $100. I’ll give you $10.” Jack makes a counter offer, maybe $90, which Jill refuses, and then Jill makes another counter counter offer, maybe $20, which is also refused. Hopefully, they eventually get to something like a price of $50, and they both agree. If so, they both got what they wanted, but only after both of them had been repeatedly told they could not have what they just asked for. 1) As you now know, in a poverty thinking world, desire is bad. Therefore, in negotiations, a huge disadvantage for poor kids is the sense of sin, i.e., the sense that they are doing something wrong by simply expressing desire. This gut feeling clouds all calm logic. It’s all one can do to make the first ask, much less quickly recover from a refusal experience and make another “ask,” risking yet another unbearable refusal experience. 2) Next, the memories of past checkout-counter refusals are so terrible that a poor kid may seek to avoid them at all costs. To do this, a common approach is to simply set the initial offer at such a ridiculously low or high level that it will be immediately and eagerly accepted without any other bargaining. The poor kid’s biggest desire– of avoiding being reminded of any past “refusal” trauma– may be greater than any desire for more money. 3) Next there is the problem with “universal limitation” thinking. Limitation thinking creates desperation. For example, you may be so broke, and without any financial “cushion,” that you believe that you cannot refuse any offer, as you cannot risk the other person giving up and not coming back with a counter offer. 5) Again, due to a belief in universal limitation, you may fear that by demanding more money, you are causing the other party some extreme hardship. You may fear that they may be in worse straits than you. (Do you recall the 3-kid, 2-drumstick dilemma, of always creating pain in others by getting what you want?) If so, your conscience may prevent you from asking for an appropriate fee for your services. You may feel obliged to accept as little as possible so as to not cause hardship to others. Or if you do bring yourself to demand more money, you end up hating yourself, for having been so selfish and cruel to someone else in doing so. Again, poverty thinking always leads to adversarial, negative, scarcity-driven energy. The real profit in business is to be found in long term relationships, and it is impossible to maintain healthy long-term business relationship if this kind of negative experience constantly occurs. Now another problem in negotiations has to do with more personal issues. Poor kids live a world where desire is bad, and that includes the desire for them . . . as people. A job is more than money. It is a treasure trove of belonging and social status. So if you were a true poor kid (in the sense that love and acceptance were scarce, and no one gave you basic social acceptance), you may have a desperate need for a potential employer to fulfill that emotional void. You may desperately want, along with money, the feeling of belonging that comes with having a job. So in negotiations, you again have another handicap, in that you are overly eager to consummate the deal. You want some kind of reward other than the money, and so you may take less money in order to assure that you get the “psychic income,” i.e., a sense of connection and belonging and social status, that you currently lack. But for all of these other problems, again, the real problem for poor kids is that a negotiation is always a series of potential refusal experiences; and for a poor kid, refusals are hard. This is because refusal experiences are what caused the pain and trauma that created poverty thinking in the first place. Now of course rich kids have all had refusal experiences too, but not the way poor kids do. Rich kids are refused some things, but they are also generally given what they really need. Poor kids, on the other hand, can remember asking for something really important . . . like say, a blanket on a cold night . . . and not getting it. This kind of refusal experience is a whole lot different than not getting something like, say, a toy fire truck. You can forget about the fire truck, but a whole night (or a whole winter) of shivering is not so easily overlooked. So for poor kids, refusal experiences are a much more difficult and painful memory. So let’s see if we can’t go back in on the patient and fix some of this. 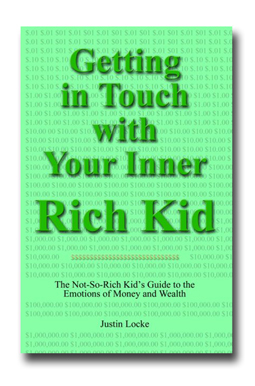 To start, a big part of going from being a poor kid to being a rich kid is to now do several things that you were once repeatedly and harshly taught not to do. The first of these is expressing desire. Easier said than done, but just remember, the people who taught you that “desire was bad” were lying to you. It can’t be stated any more plainly than that. It just isn’t true. You can’t always get what you want, but it’s okay to want, and it’s okay to politely (and if necessary, firmly) express your want. Next, it is essential to understand that, to negotiate like a rich kid, there is nothing evil or sinful about politely putting another person through a series of refusal experiences. And you must accept that you may have to go through a few of them yourself. The trick is very simple: just don’t let your mind associate the refusals of today with the refusals of yesteryear. They are completely separate. This can be hard but it is doable, and is done mostly by just not thinking. You may also have remnants of concern (or guilt) for your little brother or sister going without a chicken leg drumstick, and you may become overly concerned about the other person’s point of view, to the point where you buy something you don’t need out of concern for their welfare. This is a wonderfully good intention gone terribly awry. Also it may be evidence of a bit of an ego problem, if you think you are responsible for everyone else. You aren’t. You can’t play a game and be the referee at the same time. Other people need to hold up their end. They have the same access to the infinite resources of the universe that you do. If they claim to be pathetic, well, here’s their chance to discover strength they didn’t know they had. Children of scarcity have a hard time putting anyone else through a refusal experience, so you have to be aware of that. Other people taking advantage of your aversion to saying “no” is a common sales technique. Now of course you shouldn’t necessarily refuse every first offer. For one thing, there are lots of other poverty thinkers out there besides yourself. They don’t like to negotiate either, so they put their “best price” on the table at the start. That way they only have to go through one refusal with you before going on to the next. But in that case, if you ask for more and are refused, if you keep your mouth moving you can usually back up and accept the original offer. Expressing desire is okay. It is also okay for others to say no. The idea here is to free up the expression of desire and be more accepting of the “rich kid” free flow of acceptance and refusal. Refusals are not as hard or as permanent once you leave a poverty thinking world. In a rich kid world, there is always a second option if the first one doesn’t work out. Remember, in a negotiation it is not just your want that is being addressed. Someone else is getting their wants met as well. It is a team effort. Poor kids have a need to control negotiations, because to them it is a dangerous situation. They often try to “control” it by giving up way too much. This is, again, because of an ingrained habit of trying to always avoid refusals, as well as the habit of keeping any expression of want at a bare minimum. If you think of desire as bad, then you will think that the desire you are getting paid to meet is bad too, hence you should not be working at all. So think of other people’s desire as a good thing. And remember that your getting paid for meeting their desire is a good thing as well. If you enter into negotiations with these concepts in mind, you will be able to calmly refuse the first, second, or even the final offer, because you know that there is an infinite number of future offers to come from other opportunities. Of course, use your head and be practical. If it’s the right offer for you and it’s a fair offer for all concerned, go for it. And if it’s not a perfect deal (they seldom are), well, at least you will have more than you did before. Available thru Justin’s website (click on cover pic), also can be ordered via your favorite bookstore.